THE last thing British supermarkets need is for retail behemoth Amazon to start selling and delivering food to Brits. The industry is already struggling to deal with the reduced profit margins introduced by online food shopping and delivery services, and competition from two private German companies called Aldi and Lidl intent on slashing prices and stealing market share. But it looks like Jeff Bezos is poised to bang another nail into the UK grocery market’s coffin. Retail Week reported on Monday that Amazon has signed a 10-year lease on a former Tesco warehouse in Surrey; the trade publication said the move is “the clearest indication yet” that Britain is about to get the “Amazon Fresh” food service, which currently serves Seattle, Los Angeles, San Francisco, San Diego and New York City. 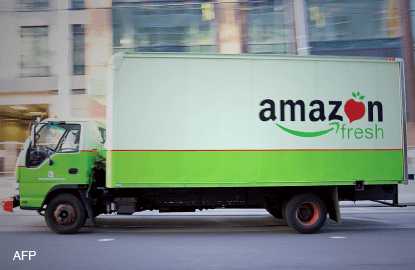 Amazon briefly surpassed Walmart recently as the world’s biggest retailer by market value; with a market capitalisation of almost US$250 billion (RM1 trillion), it can afford to spend whatever it takes to elbow its way into the UK supermarket industry, which is already “the world’s most advanced and competitive home delivery grocery market”, according to David McCarthy, an equity analyst at HSBC. Tesco, Sainsbury, WM Morrison, Waitrose and Asda are trapped in a price war amid a sustained bout of deflation that’s savaging their businesses. Food and beverage prices have dropped for 12 consecutive months, and declined by 2.2% in June. It’s hard to make money as a shopkeeper when the prices of your most basic goods are falling through the floor. According to HSBC, the UK company that’s most at risk if Amazon introduces its Amazon Fresh brand in Britain is Ocado, a food retailer that sells and delivers exclusively via the Internet. Ocado shares have already slumped by 20% in the past month as smaller, nimbler competitors with newer technology undermine its business model. But it’s not just Britain’s grocers that should fear Amazon’s arrival. Milk producers have seen the price of their product plummet in recent years, in large part because supermarkets have been squeezing suppliers to drive costs down. Milk is a staple of everyone’s shopping basket; advertising cheap milk gets shoppers into your stores, where they’ll hopefully buy other things that aren’t so heavily discounted. The price of milk has dropped an astonishing 30% since the start of last year, according to figures from the Agriculture and Horticulture Development Board, a not-for-profit group that represents British dairy farmers and whose website prominently features a guide to “Surviving Low Milk Prices”. The downward spiral has been pretty relentless. UK consumers, who have suffered lacklustre wage growth in recent years, will probably welcome the arrival of Amazon Fresh if it means they can buy even cheaper groceries. This article first appeared in digitaledge Daily, on August 14, 2015.